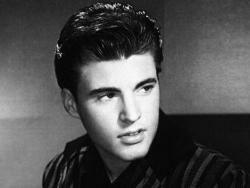 Eric Hilliard Nelson (May 8, 1940 � December 31, 1985) � known as Ricky Nelson, later also as Rick Nelson � was an American actor, musician and singer-songwriter. He starred alongside his family in the television series, The Adventures of Ozzie and Harriet (1952�66), as well as co-starring alongside John Wayne and Dean Martin in Howard Hawks's western feature film, Rio Bravo (1959). He placed 53 songs on the Billboard Hot 100 between 1957 and 1973 including "Poor Little Fool" which holds the distinction of being the first #1 song on Billboard magazine's then-newly created Hot 100 chart. He recorded 19 additional Top 10 hits and was inducted into the Rock and Roll Hall of Fame on January 21, 1987. In 1996, he was ranked #49 on TV Guide's 50 Greatest TV Stars of All Time. Nelson began his entertainment career in 1949 playing himself in the radio sitcom series, The Adventures of Ozzie and Harriet. In 1952, he appeared in his first feature film, Here Come the Nelsons. In 1957, he recorded his first single, debuted as a singer on the television version of the sitcom, and released the #1 album entitled Ricky. In 1958, Nelson released his first #1 single, "Poor Little Fool", and in 1959 received a Golden Globenomination for "Most Promising Male Newcomer" after starring in Rio Bravo. A few films followed, and when the television series was cancelled in 1966, Nelson made occasional appearances as a guest star on various television programs. Nelson and Sharon Kristin Harmon were married on April 20, 1963, and divorced in December 1982. They had four children: Tracy Kristine, twin sons Gunnar Eric and Matthew Gray, and Sam Hilliard. On February 14, 1981, a son (Eric Crewe) was born to Nelson and Georgeann Crewe. A blood test in 1985 confirmed that Nelson was the child's father. Nelson was engaged to Helen Blair when both were killed in an airplane crash on December 31, 1985.